Metabolic modeling can be an important tool in the development of microbial strains capable of high efficiency production of chemicals or proteins. 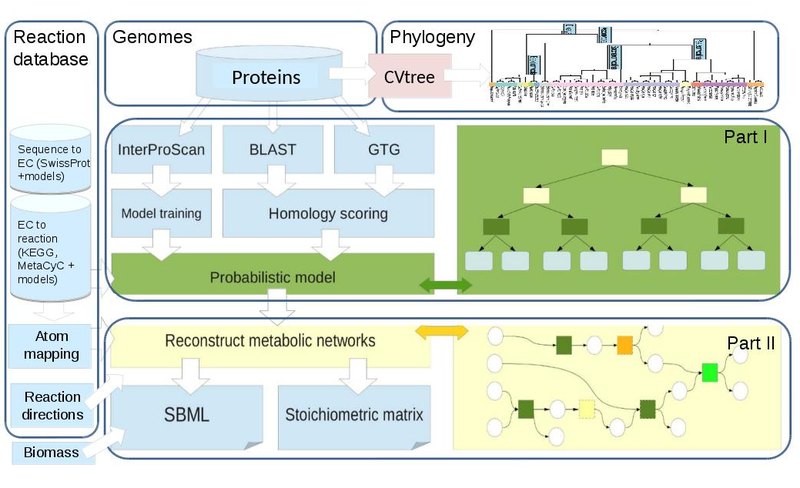 High-quality metabolic models are required for successful metabolic simulations and predictions but the reconstruction of metabolic models can be a long and tedious process. 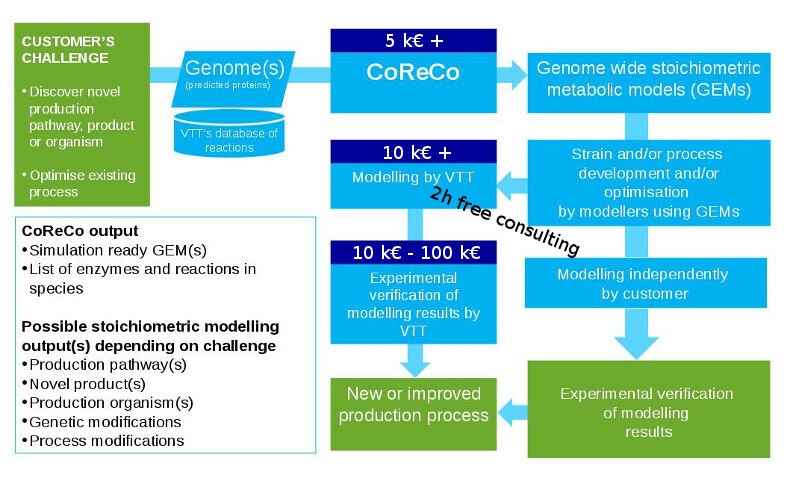 At VTT we are able to reconstruct simulation ready gapless metabolic networks using the CoReCo algorithm (Pitkänen 2014) (Castillo 2016). 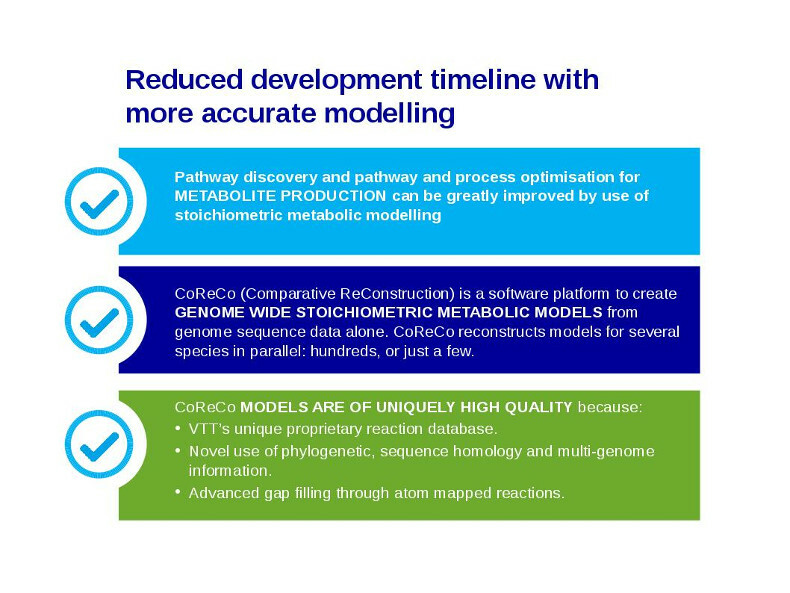 The CoReCo metabolic model reconstruction pipeline has two parts. In the first part of the pipeline, the enzyme content of the input organisms is scored. The score for each enzyme is computed based on a probabilistic model that combines homology-based scoring from BLAST (Altschul 1990) and GTG (Heger 2007) to InterPro annotations (Mitchell 2015). Including the phylogeny of the input organisms improves the prediction of enzymes in these organisms. In the second part of the algorithm, a gapless metabolic model is created by adding high-scoring reactions to the model, ensuring at each step the connectivity of the network. Low-scoring reactions may be added to avoid gaps. To ensure the high quality of the models we have created an unique database containing only atom and electron balanced reactions (Castillo 2016). The resulting models are saved in SBML format containing exchange reactions and a biomass equation extracted from the metabolic model of a similar organism which make them ready for simulation. They don't show stoichiometrically infeasible yields and very little manual curation is needed. CoReCo pipeline is set up and running in our VTT computational cluster ready to create models for other researchers as a service. Fast creation of the metabolic network of one or many related species. Setting up CoReCo pipeline in your own computer or cluster. Modelling and compound production optimization using metabolic network.